S Health made its first appearance in Galaxy S3 lasy year. It is a simple, yet useful, app. If you are Galaxy S3 owner, you probably have been used it for some time already. In Galaxy S4, Samsung revamped the S Health app with tons of new features thanks to new sensors in the Galaxy S4. For example, the built-in accelerometer can track the distance you walk or run. The barometer reports the air pressure of the environment. The temperature/humidity sensor checks temperature and humidity levels. Some accessories are available now as well. For example, S Band can measure activities and sleep efficiency through the 3D sensor without using S4. The saved data can be transferred to S4 via Bluetooth later. The HRM monitors your heart rate so that you can control exercise intensity. The body scale measure weight and send to S4 through Bluetooth. It should be noted S Health can also sync with third-party blood pressure monitors and glucose meters. S Health probably is the most valuable app in S4. To use this S Health, you need set your profile first after opening the app. Based on your physical statistics, the device calculates your basal metabolic rate (BMR) and recommends a daily caloric intake. Of course, this may be not always accurate, but it does provide a rough guidance. For your diet, the app can pull caloric information from a database of common food items. Q1 :When I tap on the start icon in the S Health app it doesn’t activate. A : Only after you fill in all the information required marked by an asterisk will the start button be “enabled”. Q2 : The Temperature measured by the S Health app is different to the temperature measured by the thermometer in my house. A : The measured values may be differ by the surrounding environment, physical contact with your body, the heat generated by the devices itself in normal operation . For accurate measurements, use a thermo-hygrometer. Q3 : The pedometer count is different from the number of actual steps. A : When using the ‘Walking mate’ pedometer feature , it begins to count after about 3 seconds from being first activated. Q4 : How much error can there be in the measurement of temperature and humidity in the S Health app? A : It is not possible to determine the measurement error. This is because the measured value varies depending on the state of the device and the surrounding environment. Q5 : What advice can you give to improvement the accuracy of measurements in the S Health app? A : Measure the temperature and humidity in a stable indoor environment. Avoid drafts of air & wind, direct sunlight and physical contact. Measurements may take some time if there are sudden changes in temperature or humidity. Q6 : The Humidity of S health is shown as being at 100%. A : If there is moisture present near the sensor for humidity measurements (located in the device near the side of the microphone hole), the humidity measurements may be affected. Please any trace of moisture from the surface of the device by wiping it first with a dry cloth. Q7 : What should I do if the value of temperature and humidity are constantly changing? A : First, please eliminate any factors that can vary the temperature and humidity. Measurements may take some time if there are sudden changes in temperature or humidity. Measure the temperature and humidity in a stable indoor environment and allow time for the measurement to stabilise. Q8 : Can I backup and restore the information gathered through S Health? A : Yes, It’s possible through using the Kies tool available from www.samsung.com. Q9 : Can I measure the blood pressure in S Health? A : No, Blood pressure can not be measured. Q10 : I want to hide my personal information such as height and weight. A : Please lock the S Health app to protect your privacy via Security function. 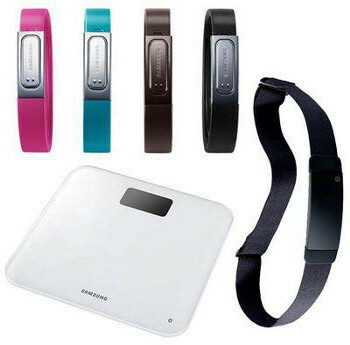 Q11 : Do I need to have my Galaxy S4 device with me whenever I exercise, if I use an S Band accessory and later connect to S-Band to my Galaxy S4 device via Bluetooth? A : It is possible to store data in the S-band itself and later transmit the stored data to Galaxy S4 device. Q12 : When I select “Update S Health” to download new features in S Health, the pop-up “Product does not exist in this store” is displayed. What is the problem? A : Sorry for your inconvenience. The software updates for the Galaxy S4 that include the S Health update feature will be released in the near future. When the new software is released, if you perform a software upgrade to your device via Kies or FOTA, you will be able to use “Update S Health” feature. The S health app in the galaxy s4 does not recognize those accessories just 2 “AND UC” and “Omron” body scales! click on health board and settings to see the facts! I just took a short walk and normally the tracker says it’s about 1500 steps. This time, I came back to discover I’ve supposedly walked 15500 steps in 15 minutes. WOW. What needs to be done to fix it. Sometimes, the sensor behaviors strangely. If it is just one-time error, you can forget it. But if it constantly gets wrong reading, you can go to local Samsung service center to re-calibrate it. Do you know the relese date of the S band? S Band should be available this month in most European countries. Other accessories (HRM, scale) should be available already in most regions. Please note, not all regions will get these accessories. Some distributors simply do not have interest. Anyway, you can always call local Samsung service centre to get detailed info on the availability. Dont understand that such a big company can make such a big fail about the S products release. im sure that they are loosing trust, when they even can make trustworthy updates about it. Shame on you Samsung…. when i purchased the phone S Health was exist but now is not exist at all >>>>why? Did you check whether you can find it in the application manager (under all)? If not, you probably can try to do a factory reset to get it back. But you need back up all your data before resetting. When is the release of the Samsung S band? (so many times i post this same question on most of the s health topic in the net. but non of them has an answer? As I know, in UK, it is in July. Some online stores already accept pre-order. Is there a chronometer in the S Health app that starts when I start taking the first steps until I press Stop? Or do I have to open the chronometer separately? Thanks in advance! Once you enter walking mate, it should start to take numbers. You can click pause to stop. The system time is always used as I know. But it is possible to reset the readings. When you check the readings, you can also select time range. Is there an API that S Health provides to send information to other apps? As I know, it is not available yet. Bought the Galaxy S4 in June. After a recent update, S Health disappeared.. It shows as com.sec.android.app.shealth under “all” in grey colour. Called up the Samsung India helpline who said to reset the phone, which I dont want to do as I will lose all gaming info.. anyone has ideas on regaining S health without resetting the phone?? Please help..
You probably can try to shutdown the phone, remove the battery, put the battery back, and then restart the phone. Thanks Simon fr yr reply. Didn’t work though. Still frustrated. .
After switching on Running Pro, walking mate is paused. I think, that it is very bad, because it is distortion of walking graph. Steps must be summed. I am sorry I am not sure about the issue you have. Maybe some other users may have a clue. I must explain. On S-Health, there are two possibilities to fix activity – Steps Counter (Walking Mate), and Running Pro. If i have a goal, for example, 10000 steps, and want to fix my routes with Running Pro (and to see on my PC), the Steps counter is paused. But i am walking and made my steps. And they are not fixed by Walking mate (Steps Counter). I have distortion of steps value. I have a Samsungs S4 mini and want S-Health were can i find it? S Health is a pro-loaded app. If your phone does not have it, you probably cannot get it. Did you update the app yet? Thanks for this post. There’s very little info out there about his app besides the basics. I would love to be able to use this on a regular basis, but I’m having some difficulty. When I first opened the app, I could have sworn that it asked for weight loss goals (ie. pounds to lose per week and an end goal in pounds). When I look at my current weight, it even shows a little green icon with “Goal Weight” next to it. However, I have no clue how to update my goal weight, view my goal weight, or change the # of pounds I want to lose per week. Any ideas here? Start S Health, touch the icon (3 lines) in the top-left corner of the screen, and then touch Settings. You can then manage and reset profiles. As far as I can see, there are no settings that can adjust the things I mentioned. I can only see how to adjust current weight, which is not what I’m talking about. Resetting the weight data also doesn’t seem to help. Once in Heath Board (after tapping the icon), you should be able to find: Walking mate, exercise mate, food tracker, comfort level, weight and Settings. Now tap settings, you should be able to find: edit profile, security, unit settings, add more features, calorie burned shortcut, compatible products, reset data, term of use, about S Heath. You can manage your profile , or even reset data. If you do not get these items, you may check whether you can update the S Health app. Another dirty way is to reset the app (you will lose all related settings for this app). In Applications manager, go to all, find S Health. You can clear data to reset the app. Go to settings-general–application manager–all–s health, tap clear data, and clear cache will reset s health. I have those features, and as I’ve explained, I have no problem finding them or executing those actions. If you can tell me how those things relate to my request (ie. changing goal weight and weight loss per week) that would be great. Resetting weight does not give you an option to set a new goal anywhere. Nevermind. I figured it out. You have to hit the android menu button when in weight, then set goal. For some reason, it wouldn’t let me do that before. Thanks anyways. I appreciate your time. Thanks so much! Was trying to figure this out for far too long! Where the heck are the accessories? Samsung promised the S band in july and it still isnt out. What is the hold up? They either need to make the s health app more compatible with other products or release their damn products. When my Galaxy S4 updated this morning (11/2/13), there was a new version of S Health. It appears that all of the blood glucose data that I had stored has disappeared, and that it’s no longer possible to track blood glucose in this app. Is that what other people are finding? Blood monitoring has gone as well. No explanation or warning from Samsung. Yes, blood pressure and blood glucose data seem to be gone after the 4.3 udpdate without any warning. 🙁 Any advice to how to restore that info (if possible at all) will be appreciated. It seems the 4.3 update messed up S Health. Probably an update will be issued in a couple of weeks. You probably have to Wait for next update. I have the same issue with the food tracker – it crashes or doesn’t add custom foods. Anyone found a solution to get the food tracker to stop this?? I believe the late Dec. 2013 update fixes this issue. It works for me now. Blood pressure tracking was one of the most important feature of S Health, Something should be done to help us retrieve the data. Is there a way of re-installing the earlier version which had blood pressure data? I don’t remember meg password to SHealth on my S4. How can I reset the password? I have a Samsung Galaxy Note 4 and have the S Health App. I was trying to find a fitness band to help track my activity, but nothing from Samsung seems to sync with the Note 4. Can you help? Gear Fit, Gear S and Gear 2 all work with Note 4. You may try RunKeeper app. You will have more options. I just accepted and update for my S Health app. I am not happy with it and really want to go back to the previous. Is there any way to do without losing current data? Unfortunately, there is no easy way to roll back the S Health update. Is there a way to get the S Health app to notify me when I am approching my calorie limit rather than congradulate me when I meet or pass my set limit? You can uninstall the update in your application manager. Once one it reverts to the app installed in the factory. This will not show data shown on the newer version. I did this last night and decided I like the update more than the factory version for my purposes. I was happy to see that since I have it set up back-up my data the cloud stored all the data from the updated app and it reloaded when I re-updated.